Handcrafted from quality hard wood, our custom cabinets can brighten up an existing room and give your new home a distinctive touch. When we say custom cabinets, we mean everything is tailor made to fit your needs. From the type of wood, to the design of the door, we work with you to make sure every detail meets your specifications. Some stores sell standard cabinet sizes and fill the gaps with strips. We design the unit to fit the exact dimensions of the space. 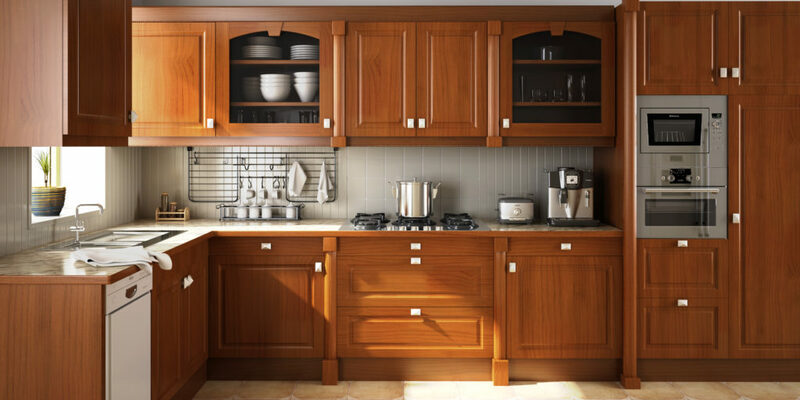 From kitchen cabinets to vanities, you can rely on SB Woodworking to deliver and install a quality product. We want to be your first choice for custom kitchen cabinets in Wichita! We use nothing but real wood and veneer core plywood on our cabinets. Popular wood choices include cherry, oak, hickory, maple, alder, and walnut. All SB Woodworking handcrafted pieces are then covered with a colorful stain finish to protect your cabinets for years to come. For a quote on custom kitchen cabinets, or other wood project, stop by our showroom at 501 E. Harry or contact us here. SB Woodworking, Inc. takes pride in good work.